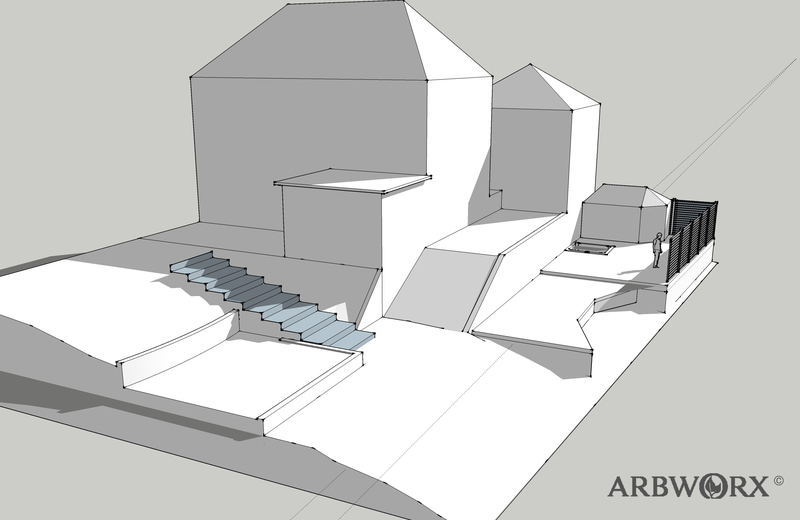 I have recently been working on the design work for a big Arbworx project in Brighton. The main part being a large multi-levelled hard wood deck with a timber summerhouse on top and a sunken hot tub in the middle. With larger projects like this some forward planning is essential in terms of sketches, construction drawings and visuals. The initial consultation will reveal the client’s ideas and ambitions for the project at this point we come away and work out how to make there perfect garden design a reality, this is were a little computer intervention can be very handy. The natural association between computers and design is of an image of hi-tech, schematics and endless complicated drawings. The reality is, it is a bit like that but computers can serve a number of purposes and not just to confuse us. 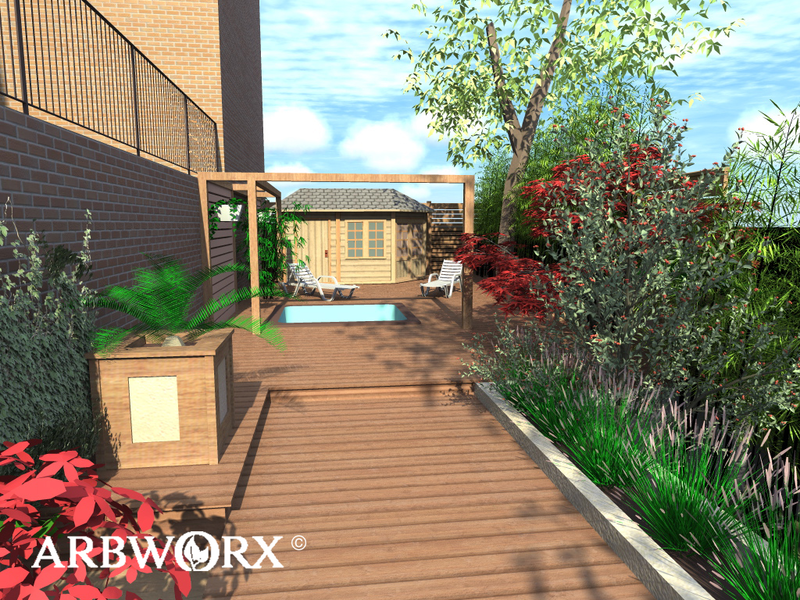 I’m going to this recent project as an example of the kind of process you can expect of an Arbworx design project. First off here is an example of a finished design render this is the kind of image that can be produced as part of a finale design presentation. The idea is that the image reveals the proposal in more detail that a black and white plan drawing. A sense of atmosphere, colour, materials and planting can be seen, capturing the essence of the design as would be in real life. Once a basic layout plan has been established through the initial consultation, survey and sketch ideas a basic model of the design can be made. This helps us understand the scale and proportions of the design, highs of walls or areas of paving for example. At this point the bigger elements of the design can be changed and tweaked until every one is happy with the layout. Here we can see the house and the larger elements of the design and how they relate as well as a light study, we don’t want the main seating area in the shade. Step Two – A little more detail. Once larger elements of the design are in place we can start looking additional details a good example of this would be seating, pergolas and planting etc. 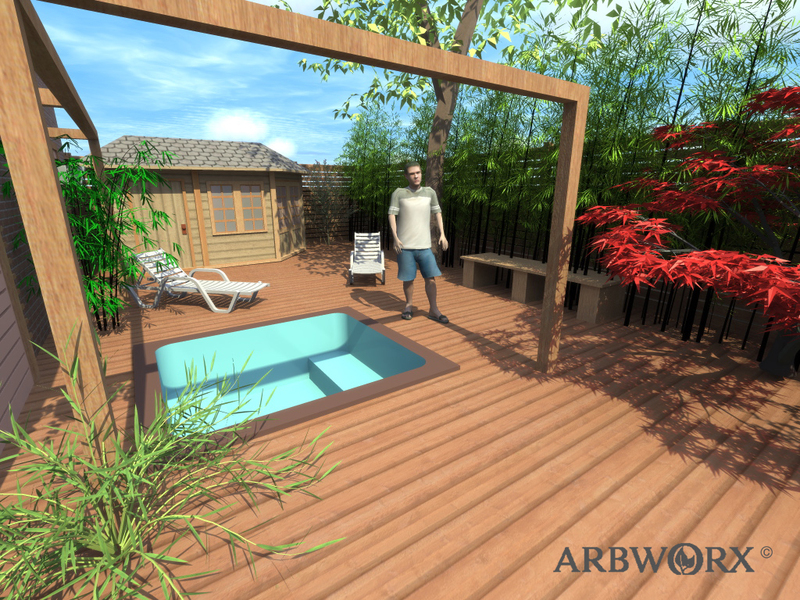 For this design the client wanted a hot tub as well as a Fin-life summer house. Items like these are modelled individually and added to the design separately allowing flexibility to move the object within the design. 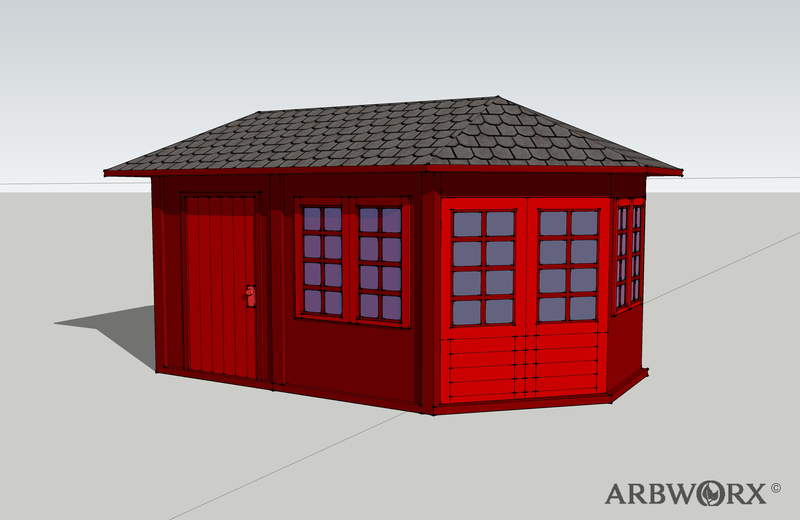 Here is the finished summer house model models like these are saved as components as they will normally form part of larger scheme this way they can be used again with out having to remodel them. The reason for the odd colouring is for next stage. Step Three – Texture mapping on the finalised wire model. A sketchy wire framed model, this image has a style applied to it to make it a little easier on the eye. One thing to remember is that whilst the model is being made it is possible to walk around, zoom in, and zoom out and take images from any angle. I like to produce a short walk through of the design and e-mail it to the client. This is a good way of communicating the design clearly and simply. We now need to bring the model to life in terms of materials, colour and atmosphere. The basic model is now colour coded (think back to the red summer house) ready to go into photographic rendering software every thing being clearly defined by its own colour makes this process alto easier especially if there are many types of wood or similar materials each colour is then allocated a photographic texture. This could be a particular photo of a martial the client likes or come from library of textures. Once this is complete the finished render is then carried out, because the garden is a complete computer model we can produce images for were ever is appropriate we can also use the model to produce construction drawing and marital specifications making for a very complete work flow from concept to reality.